The story of Peter Pan has delighted children for generations since the production of J. M. Barrie’s play in 1904. The play was later expanded into a novel in 1911 and the boy who “won’t grow up” has remained a beloved bedtime story, playground game and birthday party theme ever since. When Disney adapted the story in 1953 to an animated film, the Peter Pan story became an even more prominent part of public consciousness. With wild beasts, dangerous pirates, and mermaid lagoons, it’s easy to be swept up in the world of Neverland without thinking twice about the story’s implications for Native Americans. The original novel is remarkably less stereotypical than the Disney adaptation half a century later. The first appearance of the “redskins” in the novel is unsurprisingly one-dimensional, “they carry tomahawks and knives, and their naked bodies gleam with paint and oil. Strung around them are scalps, of boys as well as pirates,” (Barrie, 63). 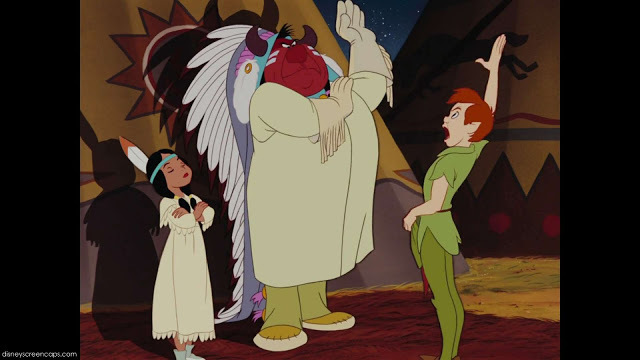 Excepting when Tiger Lily is rescued by Peter Pan and consequently vows to protect him, the “redskins” barely play a part in the print version of the tale. Although this brief portrayal is neither a fair nor an accurate representation of American Indians, the image is also not nearly as harmful as the later film adaptation. In Disney’s animated adaption of Peter Pan in a 1953, Peter, the perpetual child, and his crew of lost boys decide to entertain themselves by “hunting injuns.” The group dons feathers and war paint and while prepping for their excursion, John Darling reminds them, “the Indian is cunning, but not intelligent.” The boys are captured and led to an “Indian Encampment” by a series of shirtless men all with the same black hair and hooked noses. At one point an older Native woman demands that Wendy go retrieve firewood. Wendy’s indignant final refusal to perform these “womanly” chores is portrayed as her protesting the Indians’ uncivilized treatment of women and infers that Native Americans do not treat their women with respect. The portrayal of femininity in the film is equally destructive for British women, as female characters either are perfect mother figures like Wendy and her mother, or they are jealous, scantily clad hussies like Tinker Bell, who is very resistant to the idea of another woman entering Peter’s life and instructs the Lost Boys to shoot Wendy. The Native woman is presented as a foil for the perfectly civilized woman of England, yet both depictions, independently, present and reinforce strong anti-woman sentiments. Disney unquestionably is a giant in childhood entertainment, education and cultural representation. Millions of children grow up watching Disney films and are first introduced to parts of our society through the archetypes present in favorite Disney animated stories featuring heros, ethnic characters, princes and princesses. In Peter Pan, however, the seemingly harmless story of a boy who never grows up, is teamed up with negative and misleading depictions of Native Americans, from which one could conclude that American Indians are intellectually challenged savages who engage in nonsensical rituals and do not respect women. Growing accustomed to such dangerously racist portrayals of American Indians in childhood necessarily affects the way one will view them in adulthood. Generations have danced around like “injuns,” donned ceremonial headdresses, and minimized the cultural values of American Indians, in part, because they were desensitized to the negative stereotypes promoted through this kind of popular culture. Disney’s Peter Pan may be one of the most prominent representations of American Indians for many Americans, and could be their first and/or only introduction to American Indian culture aside from Thanksgiving stories and collegiate Cowboy and Indian parties (both good topics for additional posts). By presenting American Indians as caricatures, the Disney version of Peter Pan encourages the formation of terribly negative stereotypes in the minds of children and the adults they grow to be. At LCE,we give Disney’s Peter Pan one thumb down. Maggie Callan is majoring in English and Film/Media Studies at Colgate University; She is one of LCE’s first class of interns. ← Lakota Children’s Enrichment Welcomes the Founding Members of Its Youth Advisory Board!